Technology has made everything easier and instantly accessible in the past few decades, including hearing loss help! There are now online hearing tests that are available for people to take if they suspect they suffer from hearing loss. These online frequency hearing tests are quick and easy to take, and they can be performed as long as you have access to the internet and a pair of headphones. There are two different kinds of online hearing tests. Calibrated tests allow you to understand your absolute hearing thresholds—the minimum sound level of a pure tone that you can hear with no other sounds present. Online calibrated tests are a little tricky, because you must produce a sound in your room, and then match the volume on your computer to the volume of the sound you just produced. It is similar to a singer using a pitch pipe before they go live—you need to find the reference level for the test. Calibrated tests will normally show you how to do this before beginning the test. These tests are more accurate than non-calibrated tests. Non-calibrated tests do not require you to match a sound level. Instead, they require you to turn up the volume on your computer until you can hear a tone and then begin the test from there. These tests are less accurate than calibrated tests because turning up the volume can compensate for any hearing loss you have. Most frequency tests are non-calibrated, but these tests can still provide insight into your level of hearing loss. Interested in trying some online tests for yourself? 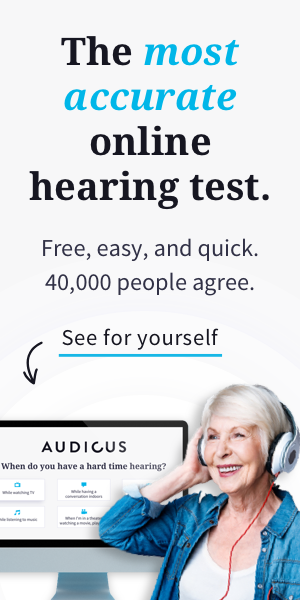 Audicus’ Online Hearing Test only takes about 10 minutes and tests decibel detection at different frequencies on the right and left ears, then retests each ear for consistency. If you’d like to test your hearing, click here to take our online hearing test for free. Take a look at AudioCheck’s High Frequency Range test, an online assessment that will tell you what frequencies you can or cannot hear. The test is a voiceover accompanied by a tone that changes frequency, from 22 kHz (most likely inaudible) to 8 kHz. If you cannot hear the end of the test, at 8 kHz, you should get your hearing checked by a professional. NoiseAddicts also provides an easy-to-use frequency hearing test, where you can listen to 12 samples of frequencies from 8 kHz to 22 kHz and determine where your frequency hearing cuts off. The University of New South Wales also has a comprehensive online hearing test that measures the sensitivity of your hearing at different frequencies. Many people who suffer from hearing loss have trouble hearing high frequency sounds, such as children’s and women’s voices, or whistles. These online frequency hearing tests can help you determine if you have high frequency hearing loss. After you take the tests linked here, take a look at your results and consider making an appointment with an audiologist to confirm any suspected hearing loss.